When I traveled through northeastern Pennsylvania in March for my TIME cover story on shale natural gas, it wasn't hard to find unhappy homeowners like Sherry Vargason. Vargason, who lives on a cattle farm in rural Bradford County, has leased her land for shale-gas exploration, and a well was drilled a few hundred feet from her front door. Not long after, she began to experience problems with her water, which comes from an underground well on her property. It turned out she had unusually high levels of methane in her water  so high, in fact, that it posed an explosive threat to her home. Methane is the main component of natural gas, and Vargason naturally connected the methane in her water to the gas operation just outside her home. But though the gas company installed a venting system on her well to reduce methane buildup, it denied there was any connection between drilling and contamination  a position the industry as a whole has maintained for years. "Unless you can prove how the contamination came, you can't do anything about it," Vargason told me. As it turns out, however, that proof may not be so elusive. A new study published in the May 9 Proceedings of the National Academy of Sciences (PNAS) shows that methane levels in water wells near shale-gas hydrofracking sites are 17 times higher than they are in wells that are far from shale-gas operations. The peer-reviewed paper is the first independent scientific confirmation of something advocates, environmentalists and homeowners have passionately argued, and that the gas industry has vociferously denied. "We found a clear relationship between how near someone's drinking water was to a gas well and the concentration of methane in the water," says Robert Jackson, the director of Duke University's Center on Global Change and a co-author of the PNAS study. The Duke researchers collected and analyzed water samples from 68 private groundwater wells across five counties in northeastern Pennsylvania and New York State where hydrofracking is taking place. Sixty of those wells were tested for dissolved methane, and most of those showed some levels of the gas. That's not terribly unusual  low levels of methane are often present in groundwater in that region, a fact that gas companies constantly cite when defending themselves from accusations of environmental contamination. But the study found that the water samples taken closest to gas wells had concentrations of methane that reached the dangerous level, enough to require urgent "hazard mitigation" action. And the researchers can say with confidence that the methane in the affected water wells came from drilling; they analyzed the dissolved gas  generating a sort of chemical fingerprint  and found that it was thermogenic methane, which comes from the same rock layers targeted by gas drillers. While the results are alarming, it's important to put them in perspective. Even if methane from drilling was clearly getting into water supplies, the researchers found no evidence that the chemicals used in the fracking process or the toxic wastewater left over after a fracking job had contaminated groundwater. Methane  while potentially explosive  doesn't pose a known health risk in water. "This is good news and bad news for companies and homeowners," says Jackson. "We did find methane a lot more often than we expected, but there was no evidence of fracking fluid." Jackson theorizes that the methane most likely escaped through leaky well casings close to the surface, at the depth at which groundwater is found, though he couldn't rule out the possibility of gas escaping via underground fractures created during the fracking process. Still, the study should alleviate  for now  environmentalist fears of fracking chemicals and wastewater toxifying groundwater supplies. That's small consolation to the shale-gas industry. A study that finds the lesser of two chemical evils in the water supply is hardly a clean bill of health. And while the industry has been discovering new shale deposits all the time, it is doing so at the very moment public resistance to exploiting the resource is growing, especially in the Northeast. Last month Cornell University researcher Robert Howarth  a fracking critic  published a peer-reviewed paper claiming that accidental methane emissions during shale-gas production meant that gas could have a higher total greenhouse footprint than coal. Though the study contained highly questionable assumptions, it dented the image of shale gas as the undoubtedly "clean" fossil fuel. None of this has gone down well with Energy Secretary Steven Chu, whose concerns over groundwater contamination recently led him to name a seven-person panel to revise standards for hydraulic fracturing  a potentially major new step as the federal government has not been closely involved in fracking regulation before. "America's natural-gas resources can generate many new jobs and provide significant environmental benefits," Chu said in a statement last week. "But we need to ensure we harness these resources safely." That will be up to the gas industry, which is at a crossroads. As I wrote in my cover story, shale gas could potentially revolutionize the energy system, not just in the U.S. but also around the world. Done right, shale can provide inexpensive, low-carbon and low-polluting energy, sourced from inside our borders. But it has to be done right, and there's growing evidence that it simply isn't. The PNAS study is just one piece of evidence  the New York Times and ProPublica have published damning investigative reports showing that shale-gas production is too lightly regulated. It's difficult even to get a full picture of the risks of fracking in part because gas companies have been reluctant to share data about their operations. "I was shocked by how little information was out there," says Jackson. The gas industry has usually responded defensively to any criticism, lashing out at academics and reporters who question whether fracking is really safe. America's Natural Gas Alliance, an industry group, criticized the PNAS study for lacking "key data that would be needed to validate its conclusions." But the industry believes it's being unfairly targeted in larger ways too. "There are forces who have an agenda that is against this fuel," Dave McCurdy, the president of the American Gas Association, told me recently. He's not wrong  there are critics of shale gas who want to see the entire industry essentially shut down, who won't be satisfied with any solutions. But the reality is that the burden of proof is now on the gas industry, not its opponents. 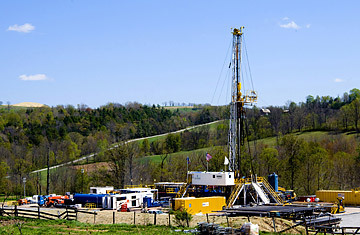 Either the industry shapes up and accepts tighter regulation, or the shale-gas revolution may come to an untimely end. See the top 20 green-tech ideas. See more problems with fracking.